You don't have to abandon your messages, contacts, photos or other valued data when moving from Android to iPhone. AnyTrans lets you easily bring all memories and essentials with you. It migrates much more types of data than anyone else could, even Move to iOS app. Besides, it's the ONLY tool that allows you to freely select and transfer specific items you want. This could save you a huge amount of precious time in transition and valuable storage on iPhone. And, of course, if you prefer a more complete migration, it's just one click away. All For FREE! No need to factory reset iPhone before migration. No overwriting of existing data & files on iPhone. Freely select and transfer specific items you want. Auto convert videos & music to iOS compatible formats. 100% stable and secure transition via USB cable. Support all devices running Android 4.0 and later or iOS 5 and later. Messages are among the first things everyone wants to migrate from Android to iPhone. To make the migration painless, AnyTrans gives a one-click solution with full flexibility. If you need all messages, then 1 click is enough to move them to iPhone in seconds. In case you just want certain important messages, AnyTrans allows you to preview and select what you need for transfer. Not only texts, attachments will be migrated as well. Photos are life memories that you'll never want to abandon. 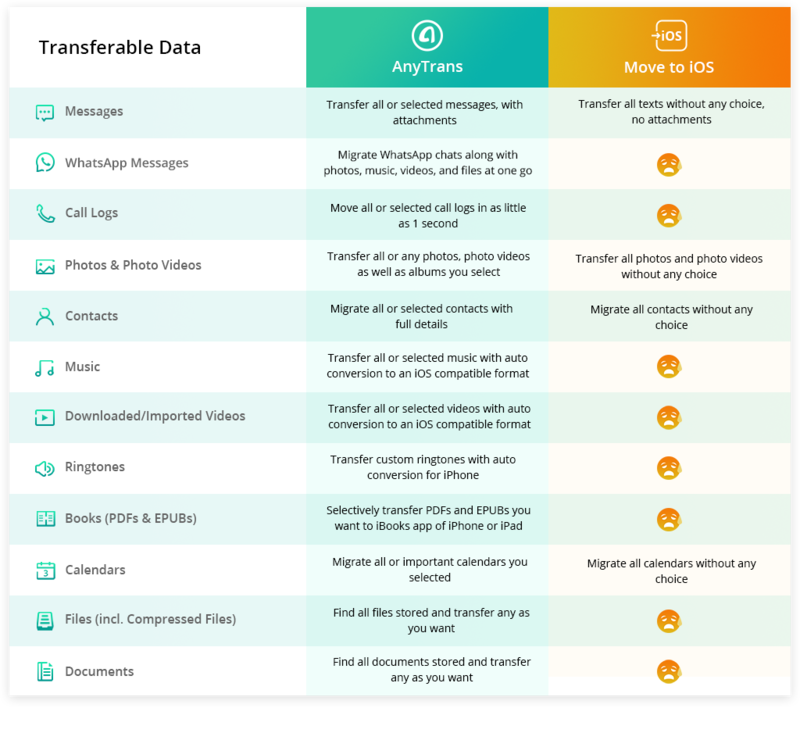 So AnyTrans moves all photos, photo videos, and albums you created on Android phone to your iPhone. Not a single file will be left behind, unless you choose to not move it. Yes, you can selectively transfer wanted photos only. Besides, AnyTrans also manages your new photos shot on iPhone. It arranges photos of different types into different folders, like selfies, panoramas, bursts, etc. You can then easily find the images you want, and quickly export them for backup or sharing. Contacts keep you connected with people you care about, and switching to iPhone doesn't necessarily break the connection. Now, AnyTrans can organize your Android contacts into iPhone. Nearly all info will be perfectly kept – name, phone numbers, photos, email, etc. 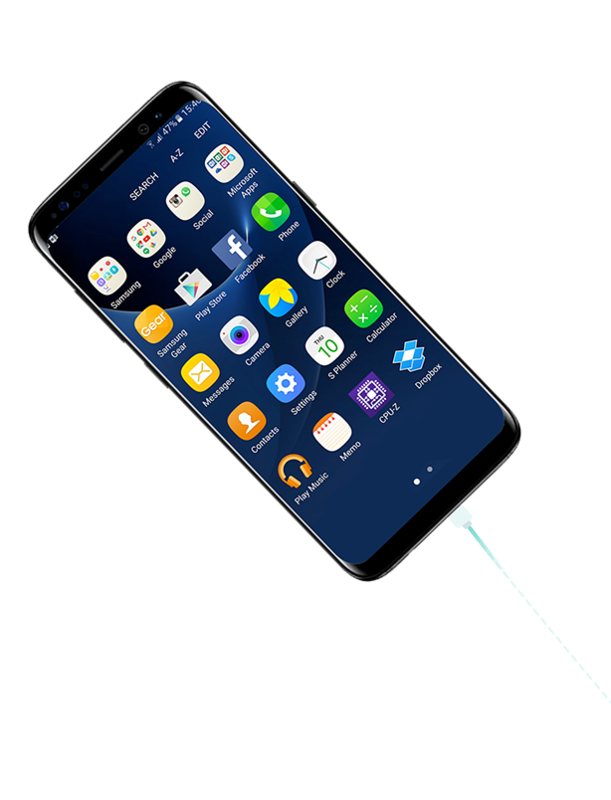 If you've added new contacts in iPhone before migration, AnyTrans will analyze all contacts, skip duplicates, integrate info of the same person, and move Android contacts to iPhone without erasing existing data. Apart from photos & essential info, AnyTrans also moves music, videos, books and more media files you enjoyed on Android. Better still, it will auto convert music & videos to iOS compatible formats. So you can enjoy them instantly in your iPhone or iPad right after the transfer completes. For the books you haven't finished reading on Android phone, they'll be available through your iPhone's iBooks app. Feel free to continue with what you love on your stunning new iPhone. 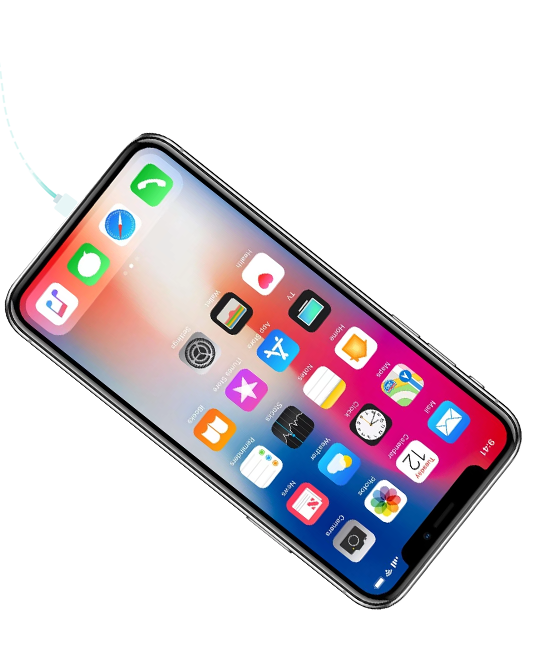 Here we've prepared a few tips to help you better manage and fully enjoy your iPhone with ease.